Sensational! Exactly what I was asking about. She looks so young there. Sorry @MagicRatAFC I don’t recognise the girl. Who is it? I wasn’t sure whether this belongs here, in the Lions Den or elsewhere. But here goes. You would need to be antipodean or some rare sort of weirdo to recognise my avatar. 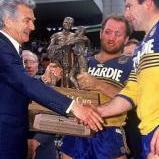 It is a photo from 1986, the year my team (the mighty Parramatta Eels) last won the comp. We are no cubbies, but the source of ridicule for many. Anyway the last time we won was the year we opened our former new stadium. 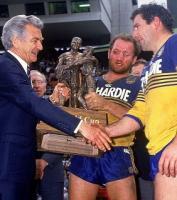 Our supporters had burnt down our previous one after we first won the comp in 1981. That new stadium was recently knocked down for a rebuild (bring on your wrecking ball). Well last weekend we opened our newest state of the art home ground with a 51 - 6 thumping of the Wests Tigers. About 20 minutes after the game they blew another hooter to signal that the spectators were allowed on the ground. Thousands poured on with their balls for a runaround and a kick with their footy. Now to come to the point of the story. Spotted on the field wearing the colours of my people and having a kick, that is Mark Evans who was the bass player for AC/DC during their heyday. Gotta love this city. I would love to hear your incognito musician everyday sports fandom stories. Wild Billy’s Circus Story and Rosalita. I couldn’t believe two tracks so different and evocative could be on the same album and from the same dude. He obviously had a lot going on and I wanted to find out more about it. Cricket World Cup is coming up. Any tips? Mine came on Monday. Only read Greetings so far. There wasn’t anything I didn’t already know. But the first ten years is my backyard. I am looking forward to more of the newer songs. I am sure there is plenty there that will be new to me. What’s the protocol here? I feel like I have to read it in order. Can I just skip ahead to some more recent faves?